A bright line policy in regards to employee criminal background checks is a dangerous practice for any employer. Title VII of the Civil Rights Act of 1964 prevents employers from rejecting or firing qualified individuals who have criminal records when the criminal history has no bearing on the individual’s fitness or ability to perform the job. What’s the takeaway for employers who use criminal background checks? Criminal background checks can be an extremely valuable tool in the employee selection process since such checks can protect against negligent hiring, workplace violence, and more. Yet organizations must have a fairly-devised employment screening policy in place before terminating or refusing employment to an individual with a criminal record. Avoid violating Title VII of the Civil Rights Act of 1964 by never rejecting or firing qualified individuals who have criminal records when the criminal history has no bearing on the individual’s fitness or ability to perform the job. Formulate and follow a policy that safeguards against unfair and discriminatory use of criminal background checks. Do not allow a “bright line” policy related to criminal records. In other words, it is not okay to deny employment to anyone and everyone with a criminal past. Create and publish your background screening policy. The policy should be specific to the risk tolerance and business goals of your organization. It should detail the types of checks to be conducted at varying levels within the organization, when and how screening is to be conducted, and what information will be collected. Furthermore, a documented process should detail step by step how the policy is implemented. It should help the subject of the report understand what happens and when. It also helps hiring managers involved in the hiring process. Consistently apply the process across all applicants and employees. A process is only as effective as its implementation and in background screening the key to implementation is consistency. To avoid claims of discrimination, employers must never conduct background checks on a selective basis. All similarly situated applicants and employees – those applying or being retained for the same or similar positions – must be subject to the same format of background check. Establish congruency between the background search and the position and risk. Find balance between your “need to know” and an individual’s privacy rights. By keeping the screen job-related you’ll naturally assess the risk of a given position in determining the type of information you need to gather. Obtain consultation and services from an experienced screening provider. 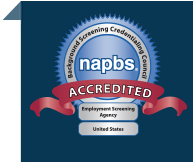 It rarely makes sense to attempt background screening without the services of a qualified background screening firm. The logistics and complexity that surround the collection and use of background data for employment purposes require know-how that most companies simply don’t have. Not only that, but a screening provider can help you create the clarity, consistency, congruency mentioned in the steps above. In the end, the cost of employment background screening services is seldom more than it would cost to run the program using your internal staff. The complexities of employment background screening can be dizzying when you consider the Federal Equal Employment Opportunity and Fair Credit Reporting Act meshed with state Equal Employment and Fair Credit Reporting laws, combined with Americans with Disabilities Act and other legal or contractual obligations you face. Before long you may find yourself wondering if it’s all worth the effort. A qualified screening provider, paired with appropriate legal counsel, can help you effectively deal with the compliance environment and get the most out of your efforts. Concerned about your approach to employee criminal background checks? Evaluate your own screening program against the criteria presented here and let the experts at Proforma help. Request a complementary consultation and download our services and pricing guide.